In his June 14 address to the nation, President Obama attributed Omar Mateen's attack on patrons of Orlando, Fla.'s, Pulse nightclub to "homegrown extremism," saying "we currently do not have any information to indicate that a foreign terrorist group directed the attack." While Obama acknowledged that the Islamic State has called for attacks around the world against "innocent civilians," he suggested these calls were incidental, emphasizing that Mateen was a "lone actor" and "an angry, disturbed, unstable young man" susceptible to being radicalized "over the Internet." It is a terrible thing to misunderstand one's enemy so deeply. The doctrine of jihad invoked by terrorist groups is an institution with a long history, grounded in legal precedent going back to the time of Muhammad. Militants who invoke the doctrine of jihad follow principles influenced by Islamic law. The point to be grasped is that the doctrinal basis of jihad generates conditions that can incite "bottom-up" terrorism, which does not need to be directed by jihadi organizations. The doctrinal basis of jihad generates conditions that can incite bottom-up terrorism. When the Ottoman Caliphate entered World War I in 1914, it issued an official fatwa calling upon Muslims everywhere to rise up and fight the "infidels." In 1915, a more detailed ruling was issued, entitled "A Universal Proclamation to All the People of Islam." This second fatwa gave advice on the methods of jihad, distinguishing three modes of warfare: "jihad by bands," which we would today call guerrilla warfare; "jihad by campaigns," which refers to warfare using armies; and "individual jihad." The fatwa cited approvingly as an example of individual jihad the 1910 assassination of Boutros Ghaly, a Christian prime minister of Egypt (and grandfather of former U.N. Secretary General Boutros Boutros-Ghaly), at the hands of Ibrahim Nassif al-Wardani, a Muslim graduate in pharmacology who had been educated in Lausanne, Paris, and London. 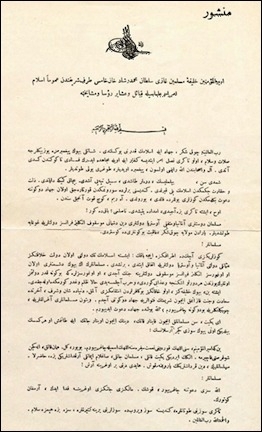 A mass-produced leaflet with the Ottoman fatwa. This Ottoman fatwa cited precedents from the life of Muhammad for each of the three modes of warfare. To support individual jihad, it referenced three instances when companions of Muhammad conducted assassinations of non-Muslims. Two of these involved attacks on Jews that were personally instigated by Muhammad. When the Islamic State issued a call for Muslims around the world to rise up and kill their neighbors, it was invoking the individual mode of jihad. This mode relies upon the teaching that when Muslim lands are attacked or occupied by infidel armies, jihad becomes farḍ al-'ayn, an "individual obligation," which a Muslim can act upon without needing to come under anyone else's command. This principle of individual obligation has been much emphasized by jihadi clerics. Abdullah Azzam wrote in his influential tract Join the Caravan, "There is agreement ... that when the enemy enters an Islamic land or a land that was once part of the Islamic lands, it is obligatory ... to go forth to face the enemy." It was undoubtedly in response to this dogma that Omar Mateen went forth to kill Americans. In line with this, Mateen reported to his victims that his attack was in retaliation for Americans bombing Afghanistan. By this understanding, it was America's military action against a Muslim country — the country of origin of Mateen's family — that justified an act of individual jihad. Preventing future "lone wolf" attacks requires the disruption of the Islamic doctrine that underpins these acts and legitimizes them in the eyes of many Muslims. Teachers and preachers in Islamic institutions across America must openly reject the dogma of farḍ al-'ayn in relation to U.S. military action. They need to teach their congregants that this doctrine does not apply, that anyone who uses it to attempt to legitimize his or her personal jihad is acting against God's laws and that no martyr's paradise awaits them. At the same time, U.S. homeland security agencies need to closely watch and monitor any Muslim teacher who promotes this doctrine, which, once it is taken on board and applied against a nation, will lead to acts of jihadi terrorism as surely as night follows day. 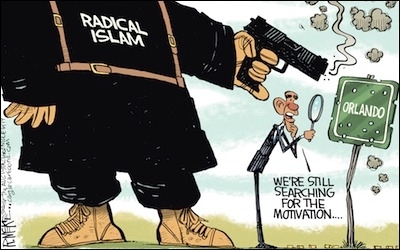 During his June 14 speech, Obama defended his refusal to use the phrase "radical Islam" in connection with terrorism, asking, "What exactly would using this label accomplish?" The answer is simple. It will be difficult to elicit the cooperation of Muslim religious leaders in discrediting the Islamic doctrine at the heart of America's homegrown terrorism epidemic when President Obama himself is reluctant to acknowledge that doctrine matters — they can simply point to him and decline. Mark Durie is the pastor of an Anglican church, a Shillman-Ginsburg Fellow at the Middle East Forum, and Founder of the Institute for Spiritual Awareness.